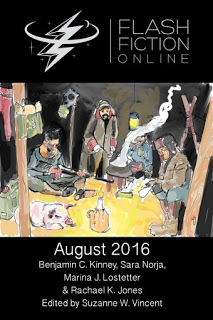 August was a busy month for yours truly, not least because it was a busy month for SFF short fiction. 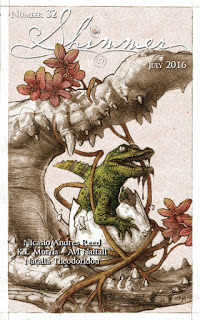 New issues of irregular publications like Orthogonal and Omenana meant a rather full month of reading and special issues like Mithila Review's "Asian SF" double kept up the output and the quality of what I got to look at. And while this month contained a number of stories I'd rather forget about, there was no shortage of amazing pieces to enjoy. So shake off the dust and pull up a stool and let me pour you something to take the edge off. August is for heat and dust and I have a flight full of longing and desire, oppression and hope. 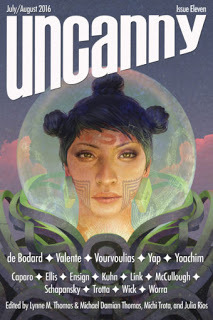 These stories kept me going even when I was having a tough time getting to everything and made me glad I pushed through another month of excellent short SFF. With an eye toward identity, abuse, family, love, and, of course, deadly assassins, "The Gentleman of Chaos" by A. Merc Rustad tastes to me like a Habanero Porter, dark and surprising with a heat and a bite and a depth that makes it incredibly memorable and incredibly good. The story focuses on a character split in some ways into different aspects. Pulled apart by a central misgendering and a magical chain that binds him to his brother's will. His brother, the king, who does not see him as a man but as only She, a tool to be used to get what he wants. It's a story that does not hold back its darkness, that does not flinch away from the avenues of death and assassination. Indeed, the killing of the book is rather detached, clinical, while the true emotion is hidden away in the quiet moments when the main character can be with those he loves. And the story does a phenomenal job of exploring how important and powerful personal narratives are, how transforming they can be, to undercut the so-called absolutes, to make lie of the magic that is used to keep She in servitude. I love the way the story uses narrative to fight against narrative, how the king is so desperate to privilege his own cruel vision of the world that he can't even imagine that he can be undone by something so simple as the truth. That regardless of the narratives that he tries to force on others, personal truth is stronger. And for a story with such a kick, with such a pervasive violence and threat, it has an enormous heart and a moving love. Like a Habanero Porter, the story starts smooth, the fire of its truth delayed but impossible to deny. And beneath the darkness and the heat there is something sweet waiting to be discovered, a hope that spreads like a warm glow the further you go. 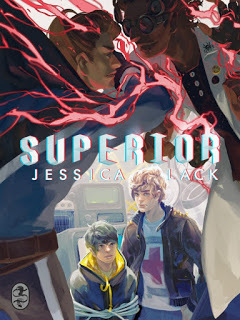 Jessica Lack's "Superior" reveals a world of superheroes and villains, wrongs and rights. And yet as simple as it seems at first, the story, like a Chocolate Stout, builds sweetness and darkness together into something complex and wonderful and decidedly fun. The story builds around Jamie, intern to a superhero, and Tad, apprentice supervillain, as they meet and explore the chemisty between them, which is pretty instantly intense. The two navigate their feelings and the rather complex situation they're in as well as scrutinize the morality of superheroes and villains, the way the lines blur when it comes down to it. The way that circumstance and corruption can flip everything on its head. And also the way the trust, once broken, is difficult to mend. The story also follows how being a hero doesn't always mean throwing cars and smashing through walls, but can look more like caring, more like being on call to direct problems to the right people. The story is also a very romantic one, the relationship between Jamie and Tad becoming the core of the story rather than any villainous plot. It's a story that surrounds itself with larger-than-life action and personalities while remaining grounded in the story of these two young men. As the title implies, the story looks at what it means to be superior, and how that idea can become a taint and a crutch, how to be truly superior you have to be aware of what's going on and never stop trying. And like a Chocolate Stout the story adds in just the right amount of darkness and then brings on the sweet, the two elements (like the two characters) combining to create something indeed superior. Tracing the path of two characters on the run from an oppressive situation, Jeremy Sim's "What Pada-Sara Means to the Elephant" seems to me like a Wheat Ale, like the taste of bread and sunlight and a new day dawning. The plot of the piece involves Anu and Shashi, siblings on the run from their home city of Tarq because, as bharjana, people able to create bread from magic, they are second-class citizens. Orphans because their parents chose to fight against this oppression, the siblings try to evade the military and in particular one officer who has taken a particular interest in them and Anu especially because of a game of strategy that Anu always wins at. It's a brilliant way of showing just how much mental energy even children in this situation must spend to stay alive, to take in the world around them. That for them the game is one that is being played on them and they have to get better and better just to stay out of prison, just to survive. Jagmeet, the man chasing them, understand only so much, doesn't have to think so deeply and so far ahead, because for him things have always been easy, always provided. It's not until the events surrounding Anu and Shashi's flight that Jagmeet has to start thinking more and I love how the story shows that his first reaction, his very first response, is to basically demand that Anu teach him how to be better, how to do better. It's an amazing way of bringing home the reality that for marginalized people, having to explain and having to educate their oppressors is not a free act. Even when it leads to understanding it is something they suffer for, and something that shouldn't be expected of them, shouldn't be presumed. It's a wonderful and moving piece that, like a Wheat Ale, tastes of long days and how rooms and a hope for bountiful fields and bright, clear skies. To me a Black IPA evokes resistance, stubborn pride, and the inky dark of space. So for me it fits very well with "Fragile Insides" by Jason Kimble, a story about the audacity of living while Skewed, forgotten and downtrodden but still capable, still vibrant, still alive with hope. The story's main character is Heady, a woman with a Deficiency that means she grew too tall too fast and so her bones are brittle and break easily. And being that fragile in a world where you can't afford to avoid getting hurt is a deficiency indeed, one that keeps her apart from those around her who Heady finds either she cannot protect or who can't stand that they can't protect her. The characters move through this vividly drawn world and love and leave, and Heady finds herself unable to give up. Despite her bones, despite the risk, she doesn't break because of what happens to her, what happens to those around her. The story is, to me, about that toughness, about being overwhelmed and not giving in, about breaking down but that not meaning a person is broken. It's a delicate line to walk, which is fitting for this story, and is pulled off quite well, with Heady always on the brink of despair without giving in to it. Holding on to what she's good at and refusing to give up on people. 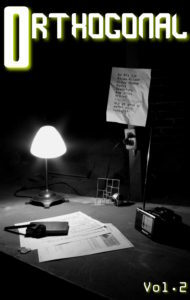 There are few enough stories out there that deal with suicide and with the stress of living poor and alone well, but this tale demonstrates a deep empathy and a defiant energy. And all against an intricate and interesting science fiction backdrop that has depth and flare. The story is a Black IPA to me because it captures that taste of bitterness but the promise of never giving up, even in the face of enormous obstacles. 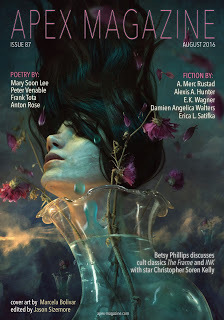 With a taste of the sea and a sinking pull, Isabel Yap's "An Ocean the Color of Bruises" hits like an Oyster Stout for me, with a memory of sweetness but the crushing reality of broken shells and saltwater threatening to drown out the past. In it, a group of friends go on vacation following their graduation to a beach where, years before, a great many people were drowned. I'd hesitate to say that there's a focus on zombies in the tale. Instead the draw seems to be to the past, to the hopes of youth and the promise that school can sometimes be, the freedom and the seemingly endless possibilities before the weight of "real world" comes crashing in like a tidal wave, threatening to scatter everyone, to drown some. I love how the idea of school and hope are complicated, how the love shared by all the characters is drawn and how they all fear. Fear dissolution. Fear loneliness. Fear that they can never again recapture the magic that existed in the small window of time when they were all busy with school, when there wasn't quite the pressure to work, to support yourself, to have everything figured out. And the characters hold to each other because there is nothing else to hold to, because only together can they kick against the forces trying to pull them under, to trap them in the cold dark of the sea. They all help each other, despite the fear and uncertainty, because what they can rely on is the love they share. The experiences that have bound them. It's a powerful story of the dark pressing in and these friends being stalked by the mundane and the stress and pressure to fit in and find a place in the "real world" when they all want so much to find other ways to live. And to me it embodies an Oyster Stout, just slightly briny but with an almost nostalgic taste of sweetness and unbridled potential. With a strong vein of revolution and hope, change and the smoke of ruin, "Rooting" by Isha Karki tastes to me like a Rye Ale, featuring a world laid low and a new order risen that seems eerily similar to the one that came before. It's a story of replication to me, showing that as humanity replicates itself to create servants and workers for its labor it also replicates systems of inequality and injustice. The story follows a group of replicated humans who are denied a true place in society despite the fact that Reps mostly rule over Saps, or "regular" humans. The difference between the main characters of the story and the Reps, though, is where they were produced. The main characters were from earlier but because of the color of their skin and where they came from they are considered inferior to the Reps, who keep them around to maintain the divide, to maintain the oppression. And yet most of the history leading to all of this has been lost or covered up, and so the main characters, the main group, has traveled to their birthplace in order to recover some of it. In order to learn what has happened. In order to find their roots. And from there to plant the seeds of something new, to help it to take root so that the injustices of the past don't have to be replicated. So that they can write their own future, just as they are able to write their bodies. It's a moving piece and a startling vision of a future where humanity has changed but still struggles to shake free of the destructive patterns that keep us all apart. And like a Rye Ale there is a brash feeling to it, a smokiness and hints of earth and metal that brings to mind the breaking of chains, the toppling of empires. Mixing hope and despair, humanity and fairy, this one is a Lost Boy to me, a layering of equal parts coffee liqueur, grenadine, and Irish cream that creates a sweet and eye-opening taste with a core of darkness. The main character of the story is a sort of prisoner in Faerie, stolen as a child and changed, made into a servant of the Queen who commands him to build a palace of despair. It is a task that he is suited to and yet even as the job draws him into his own sorrow, his own hopelessness, so to does it show him a way out. A way through the darkness and back to a place where he can remember. By facing his despair, by delving into it, he is able to cut through the apathy and the inaction that has paralyzed him, that has kept him prisoner. And I like the way that the story shows Faerie as full of wonders but devoid of meaning. 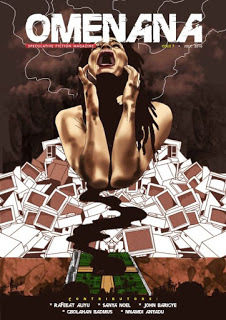 That the main character is a slave who cannot find fulfillment and only in becoming inspired, only in seeing in this palace of despair something to do and do well, can be see through the illusions and the chains and remember himself. To me it's a story that's in some ways about the creative impulse, about inspiration and about feeling something, anything, even despair, as long as it's not nothing, as long as it's not complacency. And like a Lost Body the story has a nice punch to it and despite the layered darkness there is light as well, and the lingering sweetness of hope. With an eye toward corporate anonymity and the destruction of self that can come with working for a huge business, this one tastes like a Quitting Time to me, a mix of two parts dark rum, one part brandy, and one part bourbon. The story takes a new employee through orientation at a corporation where things…aren't exactly what they seem at first, where chips get shot into foreheads and employees are stripped of their names and given numbers instead. It's a classic idea that surrounds the fear of a corporate culture where people are more valuable as cogs than as humans, but it takes it a step forward, looking at how people are expected to sell themselves away to businesses that know how to sound appealing while hiding the ugly truth of what they do. The job has very little in the way of clarity, not what the company does and not really what the employee will be expected to do, aside from not question how things run and live in fear. Of being turned in, of doing something wrong, of not performing to arbitrary rules well enough. The climate of the company is incredibly well built in the story, the language sly while maintaining the feel of something boring. Hiding the menace of what's going on, what's happening to the new employee, behind this wall of obfuscation. I love how the story slowly brings the reader to the balcony, to that last sickening realization that there are escapes and escapes and after a certain point most options narrow to just one. And like a Quitting Time, there is enough strength in this story to imagine what it's like to stand there on the balcony and wonder what the future will bring. Exploring nationalism, violence, and armed conflict, this one feels like a Toy Soldier to me, a mix of one part gin, one part vodka, and two parts fruit punch to create a blood-red drink that will knock you back and sing you to sleep. The piece feels almost like a fairy tale and is certainly grim enough to qualify, about a family living mostly isolated until they find a singing tin soldier, one whose song is haunting and in a language that they can't understand. It is a portent of bad things coming, as conflict overtakes them and soon there are flesh and blood soldiers around, claiming that the land is theirs now, forcing the family to work for them. Until things happen that force the family to take action, which might not exactly work out so well for them. The story does not look away from the horrors that conflict brings, does not deny the harm that nationalism teaches, that gets pounded into soldiers who then go off and see the world in a way that makes it okay to hurt others. To kill others. The story is full of sorrow, of lament, told from the distances of a story happening to other people and yet it invites the reader to learn from it. Not to turn away but to draw them closer and reject violence and the way that it's infectious, viral. The way that it spreads so that the family cannot escape it, cannot do much other than try to hold to each other until nothing is left, until it's all just a song in another language that means death. It's a powerful piece and like a Toy Soldier allows the initial sweetness to give way to the strength and potency of its message.